PACIFIC NORTHWEST SPLENDOR – “Ocian in view! O! The joy!” These are the original words, and spelling of “ocean,” William Clark scrawled in his journal on November 7, 1805. One could hardly blame him for forgetting his spelling lessons in all the excitement. Experience the same sense of excitement and wonder as your journey begins in Vancouver near the Pacific Ocean, the objective of Lewis and Clark’s expeditionary party, the Corps of Discovery. You will visit many historic, scenic and enjoyable sites along your Columbia and Snake River voyage to Clarkston. If you’re looking for something tailored more to a specific interest, you might enjoy the Premium Shore Excursion to Multnomah Falls or a trip to the Western Antique Aeroplane & Automobile Museum. Other dates and itineraries are available, call for 2019 catalog. 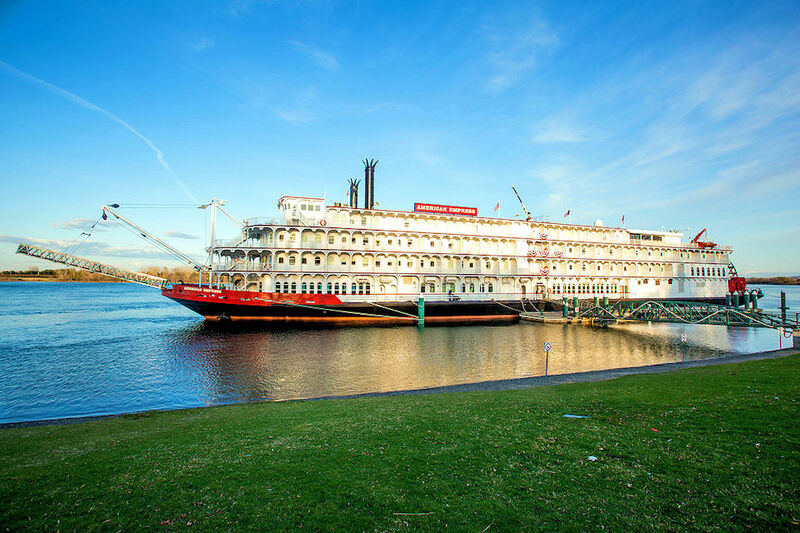 Proudly serving as the largest overnight riverboat west of the Mississippi River, the American Empress delivers classic elegance and modern luxury on a grand scale. One step onboard and you will quickly discover that there is far more to this vessel than her welcoming appearance and signature red paddlewheel. Boasting a vast collection of some of the finest historical artifacts and artwork of the Native Alaska, Russian, Gold Rush and sternwheeler eras, the corridors of the American Empress hold nearly as much beauty and intrigue as the dramatic scenery unfolding on the river outside. You needn’t be an art enthusiast to appreciate the captivating display of Pacific Northwest heritage that this unique collection represents. A river cruise aboard the American Empress incites moments of sheer perfection with her seamless blend of stunning backdrops, exceptional dining venues, dynamic public spaces and stunning décor. We invite you to step aboard and delight in the luxurious modern amenities, gracious service and endless authentic experiences that await you. * Call for single supplement and for other cabin categories. ** Cruise price and airfare depends on cabin selection & departure date selected; air pricing available approximately 11 months prior to departure. A valid passport is required with expiration greater than 6 months from return date. Cancellation charges also apply to additional charges for upgrades, transfers and other pre-purchased services. Protection plan premiums are non-refundable. Additional cancellation fees apply for air tickets. After travel begins, there is no refund for unused services, or unused portions of cruise or cruise/tour. The largest and most elegant riverboat in the Pacific Northwest. All staterooms feature a balcony or picture window with dramatic scenery unfolding before your eyes. Included deluxe hotel stay before your voyage – includes breakfast, taxes, porterage and transfers to the American Empress. Signature Hop-On Hop-Off Shore Excursions included in each port of call with private American Queen deluxe motorcoach transportation. Regional Pacific Northwest cuisine utilizing fresh ingredients creatively combined with a contemporary flair. Complimentary wine and beer with dinner. Complimentary cappuccino, espresso, bottled water and soft drinks throughout your voyage. Gracious service and warm hospitality. Country club casual ambiance, no formal wear required. Broadway caliber entertainment every evening with featured guest performances by sensational local artists. Optional: 3-day/2-night post-cruise package in Spokane. Your journey begins with a deluxe hotel stay in Vancouver. Experience Vancouver at your leisure or consider a guided Pre-Cruise Premium Excursion in Portland. You will board the American Empress in Vancouver. Visit the Astoria Column for mesmerizing views of the Columbia River and Pacific Ocean. Astoria is known to be the oldest American Settlement west of the Rocky Mountains. For thousands of years, Clatsop Indians inhabited the lands that are now known as Astoria. In 1805, Lewis and Clark led their expedition through the town and spent the winter at Fort Clatsop. In 1813, a British warship sailed into the Columbia River, gaining possession of the city and holding control until 1818, when they finally agreed to a joint occupation of the land. The British did not fully leave Astoria until 1846. There is no doubting the rich history has deep roots grounded in this Columbia River town. When the history combines with the scenery, the harmony will surely bring you back for more! Witness the beauty and bounty of nature as you tour the Columbia Gorge Interpretive Center and Bonneville Dam or journey to the cascading waters of America’s most scenic waterfall, Multnomah Falls on a Premium Shore Excursion. On the banks of the scenic Columbia River, the city of Stevenson is your launch pad to the Washington side of the Gorge. A stroll along the Rock Cove pathway or the Columbia River waterfront is a great way to take in surroundings. Downtown Stevenson is home to unique shops, art galleries, and restaurants. Stevenson is in the heart of the Columbia River Gorge National Scenic Area. Explore the eastern entrance to Mount St. Helens or the spectacular Lewis River Valley. The Dalles included shore excursions. Delve into Sacajawea State Park, the historic grounds where Lewis & Clark camped with their Native American guide, Sacajawea, in 1805. Richland is located near the confluence of the Yakima and Columbia Rivers, the northern most point reached by the Lewis and Clark Expedition in 1805. First incorporated in 1910, Richland remained a small agricultural community until the Army acquired it and 670 square miles of adjacent land in 1943 as the site of the Hanford Engineer Works which was used to produce plutonium during World War II and the Cold War. Today, the historic B Reactor and other important historical venues are part of the new Manhattan Project National Historic Park. The city is also home to the Pacific Northwest National Laboratory and a branch campus of Washington State University. Conclude your journey with a guided Post-Cruise Premium Excursion with airport transfer to Spokane. Hop-On Hop-Off Tours: Included on all American Queen Steamboat Company voyages are signature included shore excursions – your ticket to experience great river cities with selected admissions, narrated tours and our own dedicated fleet of Hop-On Hop-Off Motorcoaches®. You will enjoy hassle-free access to some of the most historically and culturally significant attractions in America’s heartland. Premium Shore Excursions click here: view all of the available excursions for your specific voyage week. Some are capacity controlled, so call Interlude to make your selection.